Assume it takes the average secondary desk analyst approximately twenty minutes to research historical and current rates when re-pricing a loan. This is usually a best-case scenario in which the secondary desk has all rate sheets easily available at their disposal; additionally, it doesn’t include any additional time the secondary marketing desk may take to correspond with investors and wait for responses when doing their research. If the average mortgage institution has to re-price approximately 45 locked loan files per month, that means that they’re spending 16 hours a month manually researching rates and re-pricing loans. This comes out to 192 hours a year, or 24 full workdays per year. Marksman’s historical pricing tool allows you to enter updated data and get new results in less than a minute per loan file. 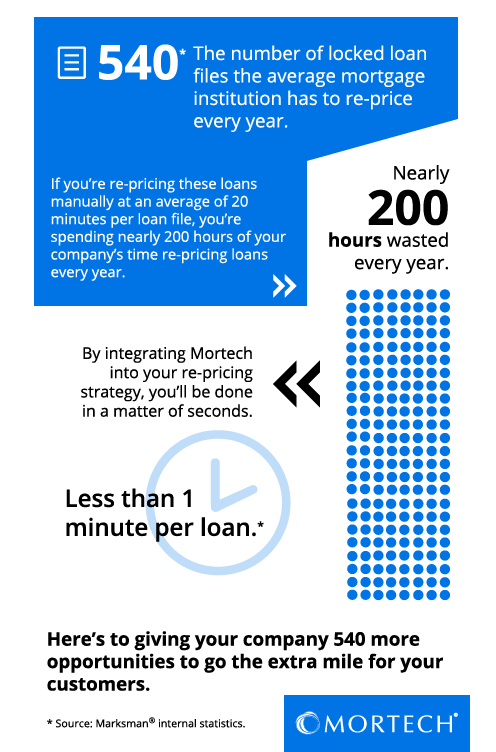 Historical pricing is just the latest way that Mortech is helping you save valuable time that could be better spent than researching old and current rates. For more information about how our product and pricing engine can better your business, schedule a free consultative demo today.